I have updated the online class schedule for 2019. Please take a look under the tab online classes at the top of this page to see the schedule. If you are interested in taking any classes in 2019, please fill out the contact us form and tell us which classes you want to take and the class date. We will then add you to the email notification list to be notified when the class registration opens. If you are interested in surface design on felt with a mixed media approach, take a look at my classes Embellishing Felt with Surface Design Techniques – A Mixed Media Approach which are presented in four modules. You can take them all or select just one or two. Each class is separate and since all the classes are online, you don’t have to travel and you can work at your own pace. I will be offering two sessions of these classes in 2019. If you would like to learn more advanced felting techniques such as using multiple resists, shaping, adding straps and closures, making internal compartments, creating a hat for the correct head size, using a hat block and much more. Take a look at Teri Berry’s two online class offerings: Felted Concertina Hats and Felted Bags. Teri will take your felting skills to a new level so that you will be confident in designing and creating your own felt hats and bags. Teri is offering 2 sessions of the hat making course and 1 session of the bag course during 2019. Please fill out the contact us form if you’re interested so you can get on the email notification list. 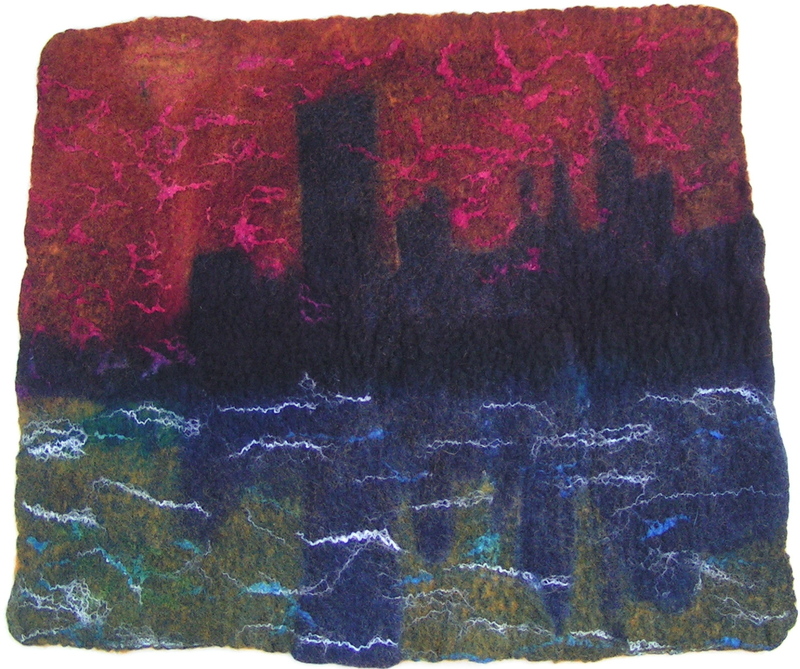 Our Wet Felting for Beginners online course is always available. If you are just starting out and need to learn the basics, this is a great place to start. Perhaps you want to put this class on your holiday wish list! Just sign up at the link above to learn the basics of wet felting, shrinkage and information about a variety of fibers that work for felting. We do have some other online classes in the works but I don’t have any firm details yet. But we are working on nuno felting, felt scarves and perhaps even some needle felted pictures. What would you like to learn about in the felting and fiber arena? Let us know and we’ll see if we can create an online class that fills that need. This entry was posted in Online Classes and tagged 2019 online classes, felting online classes. Bookmark the permalink. Thank you Ruth 😁 I have been thinking of writing a new tutorial on how to make a felted tunic with nunofelt felt, from measuring yourself, creating your resist, wool / fabric layout through to final shaping. I will most likely also combine it with a tutorial covering an alternative method for increasing your template to allow for shrinkage and how I make nunofelt yardage for those who want to use felt with a commercial dress pattern. If you are interested in taking such a course please comment below. If there is enough interest I will prioritise this so it is ready towards the end of next year. That sounds wonderful, let me know when it’s ready. Great line up. I hope to add a ruffle scarf to the line up. I just need to take some pictures and give Ruth the information. I would love a course in tunic making. I don’t sew, so being able to construct a seamless garment would be great. Hi Sharon, we don’t have an online class in garment making yet, but we’ll keep it in mind for future class ideas.